Michael e. Stern picked up his first camera when he was 12 and has been going ever since. 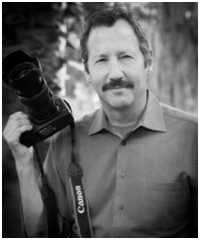 Self-taught early on, he continued his photography education in Jr. and Sr. high schools, Cal State Northridge and Art Center College of Design where he earned a BFA in 1979. He has operated small, medium and large commercial studios in Hollywood and Burbank. His career began with movie poster assignments and quickly moved towards multimedia productions for Star-Kist Foods, van conversion companies and the largest design and construction firm in Japan. Along with his commercial and retouching assignments, he also shoots time-lapse narratives. A long-standing relationship with The Walt Disney Company was established in 1982, but only after smiling and dialing for two years before getting his first photography assignment. He’s also worked with Warner Brothers, Universal, Paramount Studios and Sid & Marty Krofft Pictures. A reputation of quality, creativity and making the deadlines has driven his career forward for more than 30 years. 1995 was the year he began learning about digital capture and in 2000 he scanned, restored and printed 140 aviation-themed historical photographs for Disney’s California Adventure. As a digital restoration artist Michael continues to work on projects for educational institutions, companies and private parties. Michael teaches in a variety of formats: community college, private college, online lectures and in-person workshops. The topics of photographic theory, Photoshop, Lightroom, artist business practices and how to be successful at self-employment are his specialties. His first book: Build A Better Photograph, A Disciplined Approach To Creativity, is an informative look at his approach to maintaining a professional photography presence beyond f/stops and shutter speeds. His podcast: “Build A Better Photograph” is aimed at advanced amateurs, college students and early career professionals. Podcasts are available @ iTunes. His second book: “Remnants, the Art of Object Scanning” is available from Blurb.com.